Loarre Castle is an impressive example of a Romanesque castle, situated on a mountain above the village of the same name. Loarre is 35 Km from Huesca and from the castle you catch sight of impressive views of the plains in front. The castle was constructed on a lump of rock and you can see it from the distance. It is in quite a good state of preservation and has a nearby building with a bar, shop and information office. As impressive and suggestive as the nearby Mallos de Riglos, but for different reasons, the vision of the Loerre Castle leaves you with your mouth open. 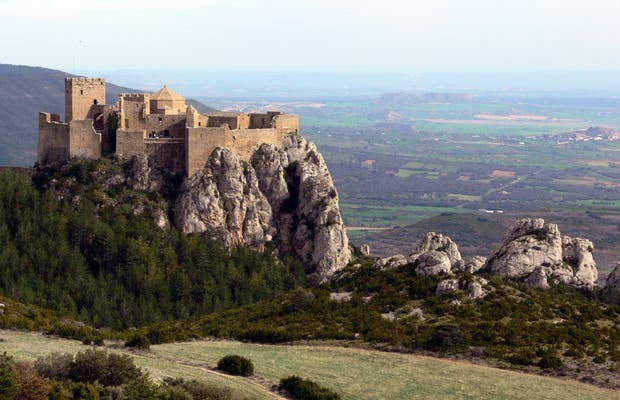 The fortress, perched over the rocky peak over the town of Loarre, seems as if it was built by a divine hand. The building is from the 11th century (it barely has been remodeled since) and it is so impressive both from a distance as from its solitary enclave. The landscape seems to cover the whole world. It is an impressive castle, one of those places where time stopped in medieval times. It is an icon of the Spanish heritage. For me, the quality of the guide was really good, and everything he told us was very interesting.